Retailing wizards Tucker and Jennifer McGeoy take their cue from the community to transform their Winnabow storefront while expanding their online toy store. While driving along Ocean Highway East, customers of Tucker’s Toy Shop might be looking for the shop’s colorful sign signaling where to turn off. But in its place is a new sign that reads Town Creek Trading Post. In response to the community, owners Tucker and Jennifer McGeoy moved the toy business solely online for Jennifer to open up her dream gift shop in its place this past July. 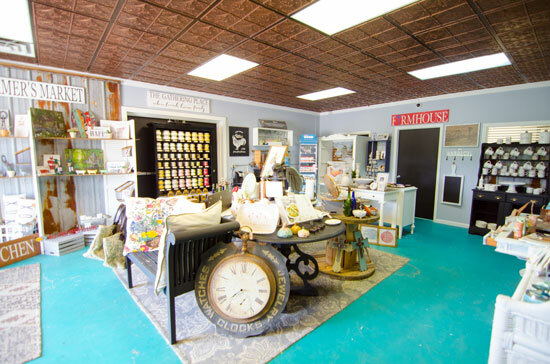 Customers looking for unique home gifts, decor and local art will find a pleasing selection in the new shop in Winnabow. “I want you to find a treasure because there’s something in here you’re not expecting,” Jennifer says. Before making the transition, the couple had participated in community events to discover their customers’ needs and to showcase their toy inventory as well as home decor and gift items. They found that customers were gravitating to the gifts more than the toys. “Nobody was excited about the toys,” Tucker says. Customers wanted to see and touch the gifts in person, and those items were typically more fragile to ship. 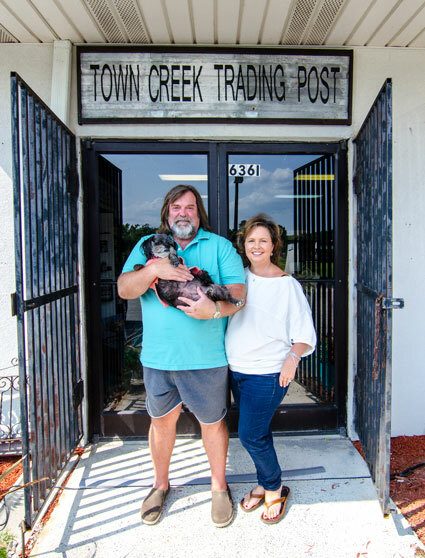 Realizing that Brunswick County needed another gift store, the McGeoys decided to listen to their customers and transform the toy shop’s storefront into Town Creek Trading Post. With interior design help from local artist Debbie Hinson as well as Michelle Maultsby, who helped with setting up and managing the store, Jennifer transformed the 600-square-foot space into a welcoming, chic storefront. The store’s tagline —All Things Pretty — rings true with kitchen items like copper storage containers, marble cutting boards and coasters, ceramic egg dishes and embroidered napkins. Colorful handbags and pillows, soaps for men and women, picture frames and barware with pithy sayings make for memorable gifts. Jennifer’s favorite part so far has been meeting and partnering with local artists to give them a venue to display and sell their artwork. “What I really want to do is get the community artists involved in this,” she says. Oil paintings, decorated tumblers and handmade signs are just a few of the locally made artworks that are available throughout the shop. For the McGeoys, managing small businesses and working in the retail industry have been a part of their backgrounds, leading to the success of their current ventures. Ever since he was a toddler, Tucker grew up in retail. First in his mother’s prominent Mississippi gifts and toy store in the early 1970s, and then as a teenager working in his grandfather’s truck stops. 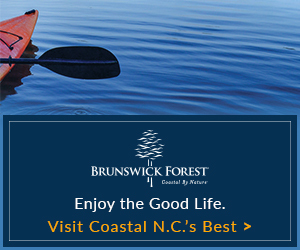 After serving a tour in the Marine Corps and studying accounting in college, Tucker returned to his mother’s shop as the bookkeeper and then later worked as an accountant for a developer in North Carolina. During his time as a bookkeeper, Tucker developed “an affinity for numbers,” he says. He streamlined his mother’s inventory by creating budgets and codes and predicted amounts of products that would need to be ordered and kept in stock. This knack for numbers came in handy when in late 2009 a toy company that he had known from working in his mother’s shop contacted Tucker asking him to create an account to sell their products on Amazon as a third-party retailer. With a $5,000 start-up deal, Tucker made his first purchase order from his kitchen table in 2010.
Business started slowly. 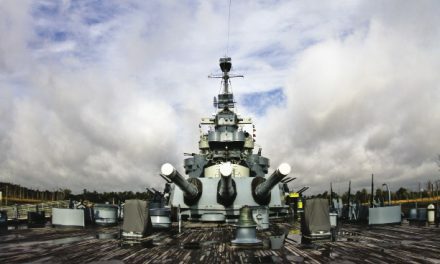 But after learning the ropes of Amazon and asking his high school friend and Navy veteran Joey Bailey to partner with him, a year later in January 2011 Tucker was selling toys online full-time and was able to quit his other part-time jobs. Jennifer also had prior experience working in the toy industry, and she recalls how Tucker stood out among the retailers. “He was, and still is, a little bit of an enigma,” Jennifer says. The toy companies knew who he was and his success with online retail, but in an industry where storefronts are deemed necessary his strategies were still a puzzle to most. 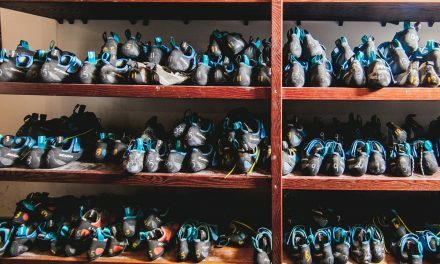 Once his business took off, Tucker ran into two problems: He was running out of space in his kitchen to store, pack and ship inventory, and some vendors would only work with brick-and-mortar stores. In 2013 Tucker and Joey found the 16,000-square-foot warehouse complex where they are still located today. They converted 5,000 square feet of the building into their warehouse while renting out the other portion to a kitchen countertop retailer. With the remaining space, Tucker opened a storefront for the toy shop in 2014 until transitioning to Jennifer’s gift shop. While Tucker’s Toy Shop no longer has a storefront, business is still moving quickly behind the scenes. The back office is where Tucker relies on his analytical side. He and his team use algorithms and codes and monitor rankings and price changes of products in the office where a few of his employees are working on multiple monitors at once. A set of double doors at one end of a short hall opens up to the main hub of the business — the warehouse. Amazon boxes and packages ready to ship are stacked, what seems, a mile high in the middle of the space. 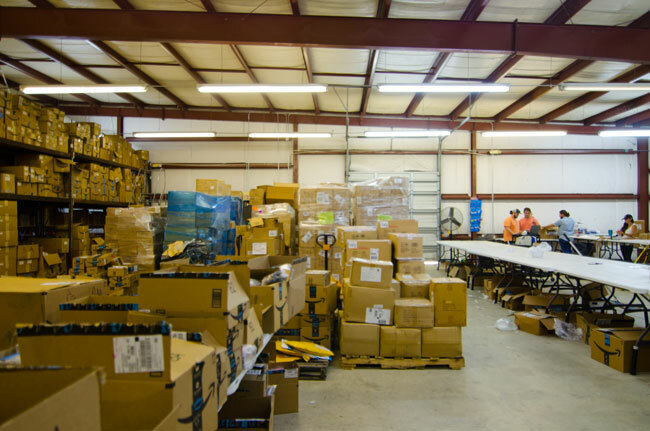 As a third-party seller on Amazon, Tucker’s Toy Shop ships either from the Winnabow warehouse or an Amazon fulfillment center. Tucker points out on the right side of the warehouse the processing area where orders are packaged on a stationary conveyor belt. Tucker’s two sons who work part-time in the warehouse are processing an order of small rubber snakes, and Tucker explains how he can give the buyer a better deal by selling the snakes in packs of two and save him money on shipping costs. The other half of the warehouse stages inventory. Anything from yellow rubber ducks and oversized stuffed animals to fake tombstones and garden statues are stored in boxes and bins. Tucker’s Toy Shop sells a variety of items including games, costumes and party items that will then be shipped either directly to individual customers or large companies such as Walmart. Aside from online retail, Tucker is also moving toward distributorship. Exiting the warehouse, he walks outside to open one of a few shipping containers on his property that is half full with multi-colored LED nightlights from a company in England that he will then distribute to other retailers. The toy shop already distributes some products for other companies like Wayfair, Home Depot and Zulily. The philosophy that has contributed to McGeoys’ business success revolves around the customer. “The business should be about anything but yourself,” Tucker says. He jokes that even though he used his name in the toy shop’s moniker, the business really isn’t about him. Jennifer has adopted that principle, too, although with some reluctance at first. She explains how she was skeptical when Tucker suggested she sell pet bereavement stones in her shop. But after a few pleased customers left with the bereavement stones, Jennifer was convinced. “We’ve both learned a lot from each other,” she says. “We are a team,” Tucker adds. With the recent changes, the McGeoys are looking to the future. Their aim is to build a retail complex on the land adjacent to the shop for more retail stores and a restaurant. Tucker says that he’s also thinking of opening a restaurant with a gift shop in another location in order to stock some toys again. “We may end up opening a restaurant so I can sell Big Bird,” he says with a laugh. But for now, the McGeoys’ focus is on growing their customer base through the gift shop. Tucker says the Trading Post is like the seed. By getting foot traffic through the shop, the McGeoys believe it will help them listen to the community’s wants and needs. In turn the couple will be able to do what they do best — give customers what they’re looking for and serve the community. 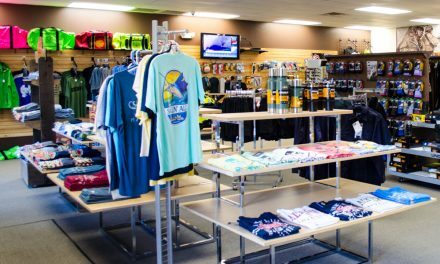 Want to check out Town Creek Trading Post? Check out their Facebook page for hours and updates.